It’s Memorial Day! I’m making this a short post, since it’s a holiday and all; but in the spirit of the day, this is a recipe that’s perfect for any party or gathering. Fast, easy, and amazingly tasty, it’ll match up to anything, from cheese and wine, to an accompaniment for soup, and everything in between. This bread is not quite a flatbread – it’s a bit too crisp for that – but it’s not quite a cracker either – it’s a bit too chewy. What it is, though, is a lightly airy bread (from the baking powder), redolent with whatever herb you choose, that’s still hearty enough to stand up to any dip or topping. I’ve chosen to use rosemary and black pepper for this, since I adore that pairing of flavors. The spice and kick of black pepper seems like a perfect foil for the almost-pine-like, not-quite-minty pungency of rosemary; and the match sets off the fruitiness of the olive oil beautifully. You can obviously use whatever herb or spice you like in this; but I suggest using a lot of it. Somehow, these crisps just seem to demand a little showiness, a little swagger in their flavoring. These are no water crackers to take a backseat to a fine and subtle cheese; no, these crisps can hold their delicious own, nothing extra needed. But whether you choose to eat them out of hand, or to pair them with something else, you’d be hard-pressed to find a faster, better, more impressive cracker. Give it a shot – I bet the compliments will come faster than the plate will empty! 1. Twenty minutes before mixing the dough, preheat oven to 450º F. Place a baking stone, or a large baking sheet upside-down, in the oven to heat also (see note 4 below). 2. In a medium bowl, whisk together the flour, rosemary, pepper, salt, and baking powder. Add the water and olive oil, and stir together until a rough dough forms. Turn dough out onto a work surface and knead a few times, until smooth. 3. Divide dough into 3 even pieces. Place each on a piece of parchment paper, using plastic wrap to cover the pieces not being used. Roll each out to a 10 inch round, or as thinly as possible. Sprinkle each with salt. 4. Transfer each piece to the heated baking stone or baking sheet, cooking in batches if necessary. Bake for 8 to 10 minutes, or until golden brown in spots. Remove from parchment and transfer to a wire rack to cool. Break into irregular pieces to serve. 1. 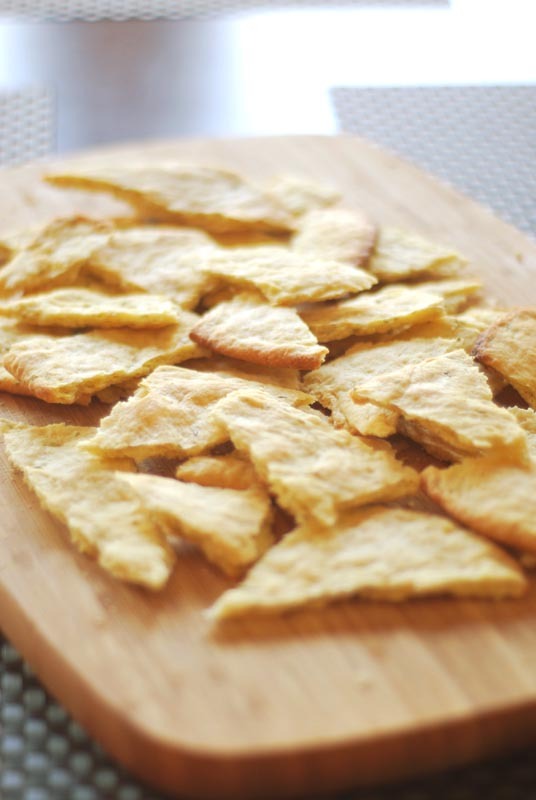 Crisps can be made a few days ahead and stored at room temperature in an airtight container. 2. Feel free to use whatever herb or spice you prefer; but make sure it is of good quality, as the flavor is quite prominent. 3. I used some fresh rosemary that had dried in my refrigerator, which I ground coarsely in a mortar and pestle. Fresh rosemary would be just as delicious, and should be used in slightly less quantity. Store-bought dried and ground rosemary should be added to taste, as it can vary widely in pungency. 4. If you don’t have a baking stone, position the oven rack in the top third of the oven. The heat from the roof of the oven will help cook the crisps at a greater intensity, and give better color. 5. Be sure to let your oven heat for at least 20 to 30 minutes before baking. This will ensure more even cooking, and give a more tender result.